The bus set off from Warragul for our very first Art and Design tour. At Helen Timbury Designs we got to be kids again as we turned the wheel on the old printing press. It was fun to have a go and feel part of the process and my little wombat print is very much at home in my office. At Beady Wendy’s studio we were drawn to her beautiful creations, her jewellery and ornaments cast reflections around the space. Spectacular beads of all shapes and colours adorned the workshop as Wendy melted and shaped the glass in front of our eyes. We waved goodbye to Wendy and headed down the highway to Nickelby at Darnum where a glass of bubbles awaited us. The group relaxed around a heavy wooden table in a beautiful studio that was surrounded by alpaca garments. From the large windows we could watch the alpacas graze in the spring sunshine. We were lucky to have a sneak peak at Angela’s new collection which is almost ready for the catwalk at eco fashion week in the Gold Coast and Fremantle. For lunch Angela served us an amazing spread including local wine and olives, followed by delicious coffee and cake. We also got to meet the fluffy and very cute alpacas to top off our visit. With full bellies we headed off to our next stop at Pilgrim creek studios where we were welcomed at the door by Kerrie Warren. Kerrie is an internationally recognised contemporary artist and wowed us with her gallery collection in the splatter studio. 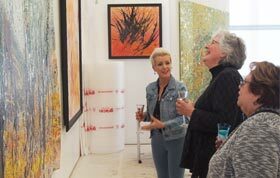 She has a special piece titled ‘bonfire’ which is truly spectacular and draws you in with its colours and sheer scale. These works left us amazed and delighted. Kerrie’s studio is set to a backdrop of vines and the Baw Baw ranges which I am sure helps inspire her creations. From the main studio we strolled down to her quaint little pottery studio that is a converted dairy. We were drawn to her pottery and sculpture by her use of texture, colour and some very realistic looking creepy crawlies. The Art and Design tour is an inspiration for anyone who loves beautiful things and the tour makes a perfect gift for that creative person in your life. From our lunch overlooking the green rolling hills of Gippsland to the behind the scenes access to so many talented artisans, this a day to share and remember.